Positive action last week keeps the outlook in an uptrend as we start the month of February. Punxsutawney Phil didn't see his shadow, so we don't' get 6 more weeks of a bear market...that's how it works, right? In the weekly view, we see another close at the highs...that's 5 straight weeks. Three of them on higher than average trading volume. The 2018 Q4 downtrend we've been following is finished and prices ended the week above the 40-week moving average. We still don't have a "low" to use for the new uptrend. But we can say that when we do see that low, it represents a good buying opportunity in the near future, rather than a continuation of the downtrend. 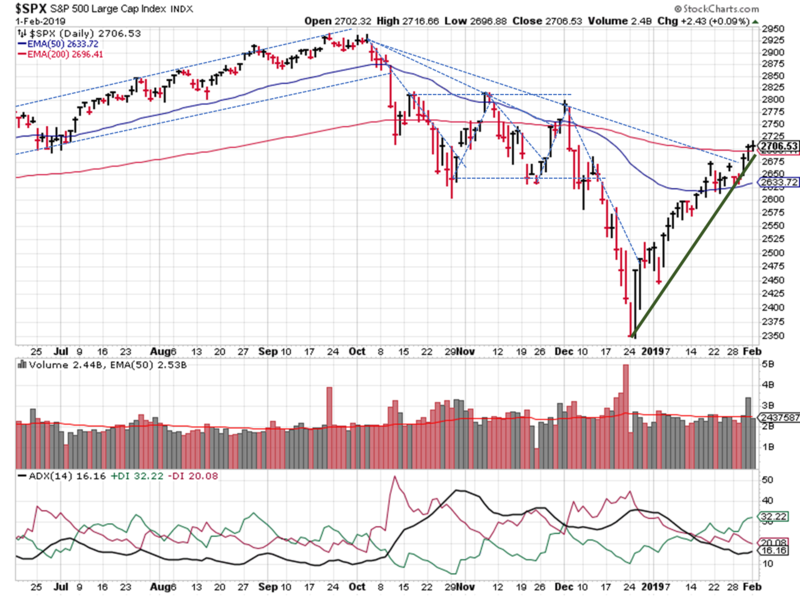 Switching to a daily view, the S&P ($SPX) found support at the 50-day moving average, broke the 2018 Q4 downtrend, and closed above the 200-day moving average (with volume). 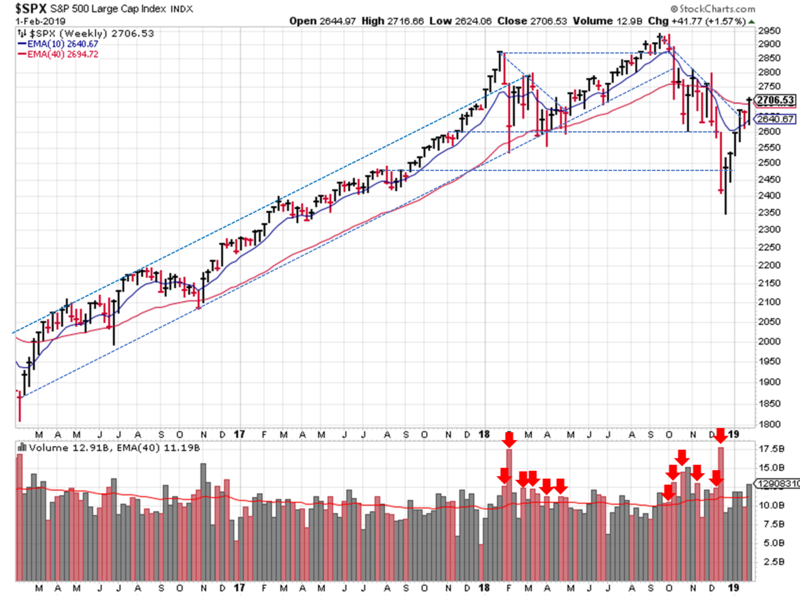 Mirroring the weekly view, the SPX still needs to put in a higher "low" price of some kind. For now, we'll use what we have to estimate the trendline. The DI+ / DI- continues to show a bullish environment. Price and volume was bullish last week, courtesy of high volume accumulation days. The latest OEW analysis also puts us back in an uptrend, with the probability of a new bull market 80%. So what investing "lessons learned" can we take away from January? Don't fight the Fed. 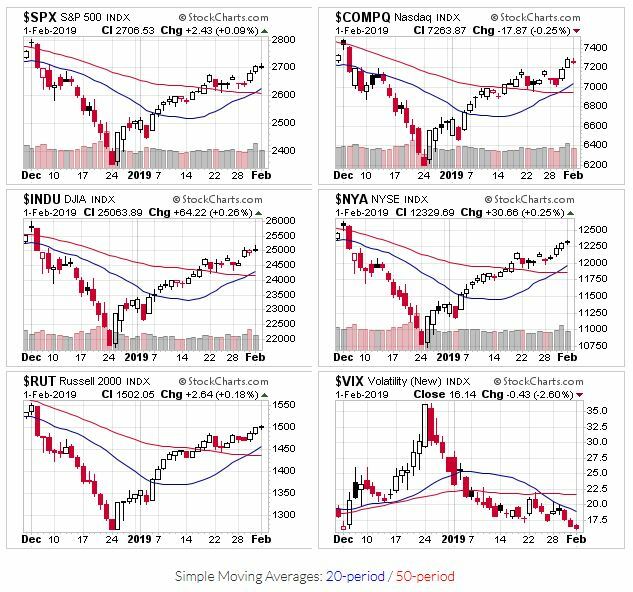 It's amazing what a few dovish speeches will do in today's trading environment, considering nothing has changed in the past few weeks (underlying fundamentals, etc. ).